Back in my university days, after a long days worth of studying my ritual method of unwinding involved a two hour session on Incognito’s iteration of Warhawk. Though Warhawk came early in the PS3’s cycle there were still numerous titles that out-did it visually. I hear many people ask, what exactly was the appeal of that game? Well for me; it wasn’t about graphics or your K/D Ratio, or having an epic single player campaign. Warhawk to me was about actually having fun playing with and against other players. Nothing more, nothing less… It was easy going but challenging enough to encourage you to try new tactics on the battle field. That same fun stress relieving experience has been absent for four and a half years, until now. Lightbox interactive were assigned the task of bringing the idea of Warhawk back to life with a new coat of paint. Enter Starhawk – which takes the theme into the future and presents a few new concepts. One of the most notable differences between Starhawk and its predecessor is the addition of a single-player campaign mode. In this mode you assume the role of Emmet Graves. The game is centered around Rift Energy which is a new source of energy in space being mined by humans. Outcasts who have been over exposed to the Rift Energy wish to steal it and use it for their own addictive needs. After Emmet and his brother Logan’s farm is attacked by Rift Outcasts both brothers become exposed to Rift Energy. Logan becomes an Outcast but fortunately Emmet is saved from becoming an outcast thanks to an implant that a friend installs on him. Throughout the game you’ll be acting as a mercenary, traveling to numerous Rift mines to help them fight off Outcast forces. You’ll be presented with inFamous like graphic novel story telling between missions, which looks cool but unfortunately it gets fairly boring. It’s not that Emmet isn’t an interesting character, it’s just that his story isn’t told in an overly interesting manner and thus it becomes hard to care for. The campaign quickly begins to seems like a tutorial on how to play the game before you decide to dive into the online mode. Which is a bit of a let down when you consider the amount of stock put into the single-player campaign during marketing. In terms of game-play Starhawk controls very much like how I remember Warhawk. At first the L2 and R2 controls were confusing, as L2 lobs grenades and R2 is used to sprint; I personally would prefer those to be swapped over due to the fact that R1 is your trigger so it makes more sense for me to press R2 for grenades. When I first played I found myself lobbing grenades right in front of me in an attempt to sprint due to this slight confusion. I’m sure there may be a way to change controls, but If you’re anything like me then you’ll prefer to play the game how the developer wanted you to. Seeing as the whole story behind Starhawk is centered around Rift Energy, it makes sense that the gameplay should allow you to utilize the energy source. In both the single-player and multi-player modes you are able to build structures to either defend your base or bring offense to the enemy. To do this you need to build up your Rift meter, which fills up automatically if you are near base. Otherwise you can replenish your Rift meter quicker by simply killing enemies or shooting Rift containers. The build and battle mechanic is one of the most important features of the game. Building the right structures in the right places can make the difference between winning and losing, especially once you get to the multi-player side of the game. Pressing triangle will bring up the radial menu, it displays which structures you’re able to build given your Rift meter level and the map you’re playing. Once you begin to built stations that spawn tanks, jet-packs and Hawk mechs the excitement really begins. Starhawk isn’t too exhilarating as a 3rd-person shooter, so it’s taking control of these various vehicles that provides the most amount of fun in combat. Hawk mechs allow you to transform into Starhawks and take to the skies picking off enemies in the air or on the ground. I personally prefer transforming back to a mech to take on ground enemies, but there are many skilled flyers that can effectively aim down upon a foe from the sky. It takes some practice to get really good at controlling the Starhawk, but it’s definitely worth the effort as they are an essential part of dominating a horde of enemies. It’s clear that most of Starhawks longevity will come from the multi-player online portion of the game. Usually 3rd person games are heavy focused on campaign story modes with the online being an additional option to keep players interested after beating the campaign. 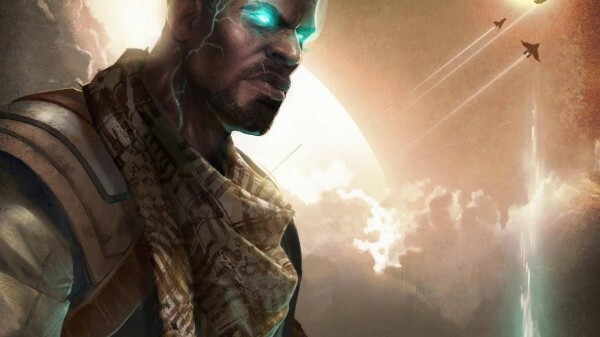 Starhawk is a huge exception, and it’s an exception that is certainly needed on the PS3. One of the big criticisms for the PS3 platform is that aside from the huge 3rd party block buster titles, they lack enjoyable online experiences. Starhawk breaks this notion by providing a fun immersive online experience that keeps giving. There are four main modes to chose from online; Capture the flag, Zones, Team Deathmatch and Deathmatch. My favorites by far are Capture the flag and Zones (taking over all zones to win) as you’ll find that you’ll have to be more strategic and actually work as a team to make a difference. Another misconception about PS3 is that people don’t talk, but I’ve found that Starhawk has actually encouraged a lot of people to get on their headsets for the purpose of working in a team. Starhawk is a game that highly encourages team/clan based play. I’ve seen clans get together and dominate a server for hours. If you haven’t already got a clan in mind, then you will surely get a ton of clan invites as you level up further so it’s impossible to feel left out. Through the clan menu you can see clan rankings, stats and you can initiate clan vs clan battles. As you rank up you’ll also unlock customizations for both your character and your vehicles which you can assign by entering the customization menu. You’ll also earn skill points which you can use to activate a skill (basically it’s a perk system). Add all those entities together and you get a truly addictive online multi-player experience that has the potential to hold your interest for months to come; especially with the summer incoming. Some may only wish to jump into Starhawk provided they have enough friends to accompany them, it’s easy to feel lost amidst the 30 other players in the room. You’ll find yourself dying frequently if you or your team don’t know what you’re doing. But on the other hand, there’s nothing like jumping into a random match on the losing team and then being there to turn the tides. It’s the beauty of Starhawk; that building a turret, a supply bunker or a Hawk station can make all the difference. This game comes highly recommended for those seeking an original multiplayer experience.